It's time again for Secret Recipe Club reveal! My secret blog assignment this month was Not Enough Cinnamon. Born and raised in Paris, Marie now lives in Sydney, Australia. Her blog is full of unfussy recipes you can actually make, with simple ingredients you probably already have. I love that approach! Many of Marie's recipes also focus on health and using real, unprocessed ingredients. I'm pretty sure I will be trying several of those recipes! 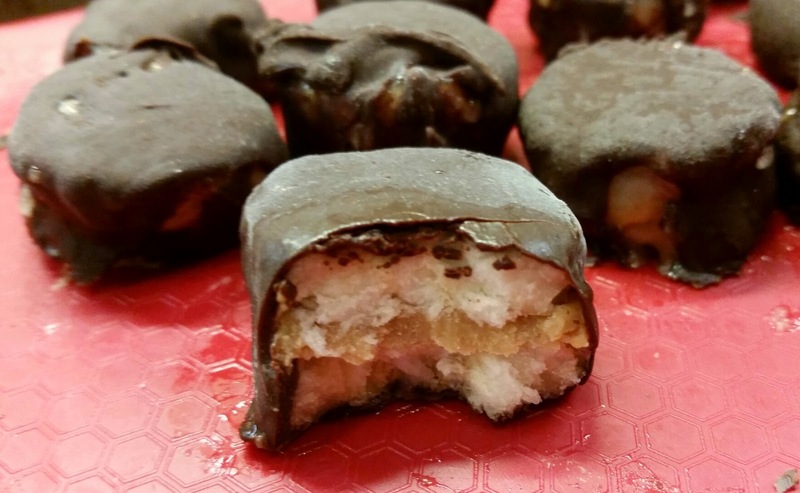 But the second I saw this recipe for Chocolate Covered Frozen Peanut Butter & Banana Bites, I knew I had to try it. To be honest, I wondered why I'd never thought of it. You're wondering the same thing right now, aren't you? Three perfect flavors together, frozen, in bite-sized pieces. What could be better? Slice bananas and place on baking sheet lined with parchment paper or silicon mat. 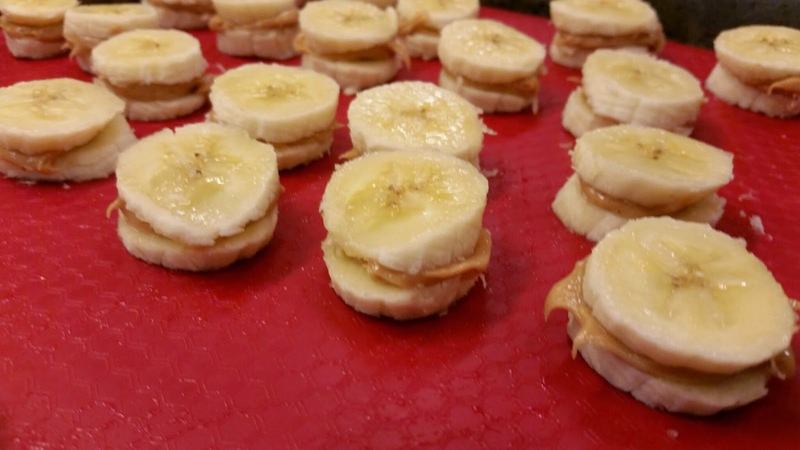 Put peanut butter on half of the banana slices and place a second slice on top. Place in freezer and freeze for at least 1 hour. Break chocolate into pieces and put 2/3 of it in a double boiler or place a heatproof bowl over a small saucepan filled with simmering water. On low heat, stir chocolate until melted. (Or place chocolate into a microwave safe bowl. Microwave on medium power for 30 seconds, stir, then repeat at 15 second intervals until the chocolate has melted.) Add the remaining 1/3 of the chocolate and keep stirring until it is fully melted. This is to allow the chocolate to have a glossy texture and to set correctly. Remove bites from the freezer and dip them in melted chocolate. 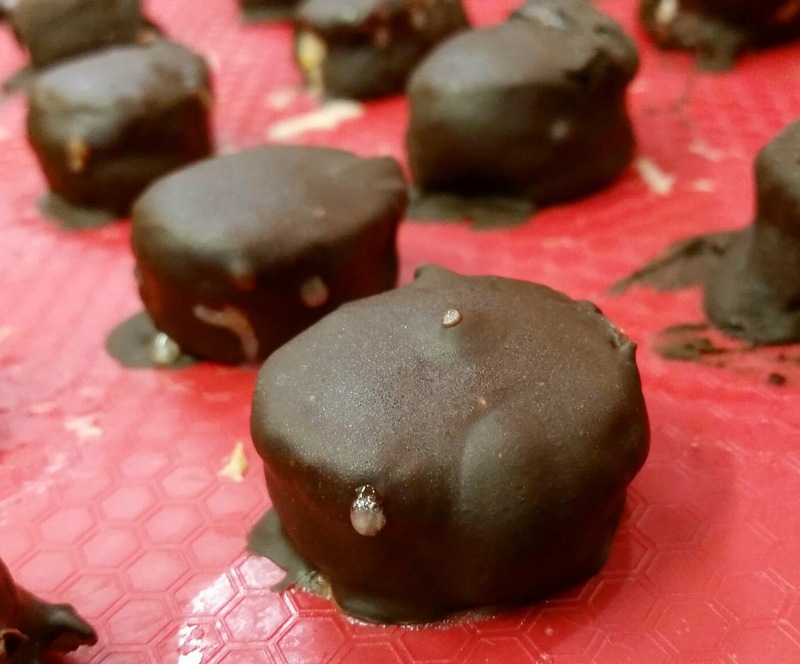 Working quickly, so bites don't begin thawing, dip one bite at a time in melted chocolate and roll it to cover all sides. Use one fork to remove bite from chocolate and a second fork to remove excess chocolate and arrange bite back on baking sheet. You may want to leave most of the bites in the freezer and work with a few at at time so they don't start getting mushy. Note: I have not worked with chocolate much, so I had some issues with this. The frozen bites made my chocolate stiffen up so that I couldn't coat any more of them. I added about a T of coconut oil, stirring that into the chocolate, over low heat, until it was smooth and shiny again, and then I could coat the rest. Only use coconut oil as needed. Once all the bites have been coated in chocolate, return them to the freezer and freeze for at least 3 hours. Slide a butter knife under each of the bites to remove them from the baking sheet without losing any of the chocolate and store in a covered container in the freezer. Enjoy! Oh yum! I pretty much always have frozen bananas in the freezer. Yes, they're great for making a batch of banana muffins, but they're also the perfect snack on a hot day. Add some peanut butter and chocolate, and it's even better! The hardest thing is going to be not eating all these at once.